Update November 2011: I think this site is now totally free. I don't have time to check my review just now, but have put it on my list of things to do! Review Summary: The Daily Makeover allows you to try on virtual makeup and accessories (necklaces, earrings and hair accessories) as well as virtual hairstyles and hair colors. It is an amazingly sophisticated piece of software. Though if I was just looking for a hairstyle I probably wouldn't choose this program because you need to be quite particular about the photo you use (see below). And it's a bit fiddly using all the controls to make selected hairstyles look realistic. Other programs make this process easier. However, if you also want to try out new makeup looks and experiment with accessories, then this is a great program for you. The realism of the makeup application is simply amazing! The 1-click looks are also a great idea. Register for free to try it yourself. Pros: Easy to use. Lots of great hairstyles to choose from -- both salon styles and celebrity styles. Makeup application is amazingly realistic. Can change your eye color using colored contacts -- this feature together with foundation and hair color allow you to see what you look like with a totally different color scheme! Cons: The program can be a bit slow to respond. The sophistication of the software makes it a bit fiddly to use. Because my hair wasn't flattened or entirely off my face in my uploaded photo none of the hairstyles I selected looked particularly realistic. Not enough help with hairstyles for face shape. Pricing I believe membership is now totally free! Free trial? Yes. This includes uploading your own photo (you need to sign up), but only gives you limited access to hairstyles and all the other items and features. I think there's now free access to all features of this program. Hairstyle search options? Categories include: celebrity and gallery (salon styles). Celebrities can be further filtered by name. DailyMakeover has virtual hair styles, hair colors, makeup and accessories (jewelry, eyewear, hats and hair clips) for women. There are both salon and celebrity hairstyles. There are 2 versions of the limited access free trial available, 1 that lets you use their models and the other that lets you upload your own photo as well (sign up to get this feature). Both options allow you to try on a limited selection from any of the categories. The items that are not available are indicated with a lock symbol. If you click on one you get a message suggesting you upgrade to full membership. I signed up and uploaded my photo. This is a very easy process and prompts you to adjust the tracing of your face shape and facial features. The first time I tried I got a message telling me my photo was too small and to try again, which I did. You can also adjust you face outline and feature trace at any time. You are then taken to the Makeup area. Within the Hairstyles tab the 2 main areas are Celebrity Styles (selected first) and Hairstyle Gallery (which contains just the salon styles). There's a carousel of celebrity hairstyles that you navigate by clicking on the edge of a photo or by using the slider. You can also narrow your selection my entering part or all of a celebrity's name. The Hairstyle Gallery allows you to filter by various lengths, bangs (fringes) and textures. When you've identified a style you like click on the hairstyle. You then have various options including changing the hair color, searching for and selecting a new hairstyle, changing the model you're using or switching to one of your photos. You can filter colors by color category. You also have a number of controls to make the hairstyle fit your photo or model better. These include adjusting the width and length of the style, re-positioning the hair (by dragging), rotating it, and even flipping it to get a mirror image so the parting is on the opposite side (nice!). Though I found it a bit fiddly getting some of the styles to fit. For best results, in the photo you upload, you should have your hair off your face and flat (look at the models for examples), otherwise your own hair will show under and over your selected hairstyle. It would be nice if the program could fix this automatically as some other programs do! On my uploaded photo most of the styles didn't look very realistic because of this. The Makeup tab allows you to try on face (foundation, concealer, blush), eye (shadow, liner, mascara, brows) and lip (lipstick, gloss, liner, teeth) makeup and changes. The Accessories tab allows you to try on jewelry (necklaces and earrings), eyewear (sunglasses, glasses, contacts -- including colored contacts) and hats and hairclips. 1-click looks lets you select a total look from various categories to apply to your photo or model with one click. You can have a lot of fun with these makeover solutions and see what you would look like if you changed everything about your coloring! The Makeover Solutions' Daily Makeover contains many hairstyles and colors and can help you work out your next hairstyle and/or hair color. However, where it really comes into its own is for trying drastic virtual makeover solutions with the makeup, accessories and 1-click looks! 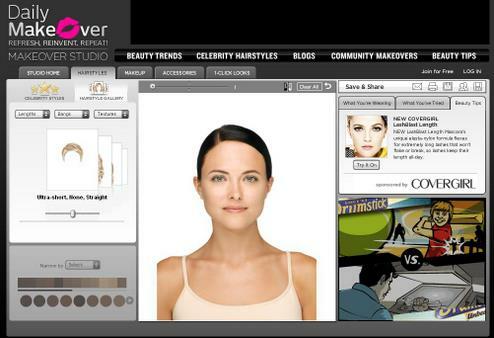 Try the free trial of Daily Makeover and see for yourself.